There’s no one better than the boy next door. At least not according to Aurora Campbell, fourteen, who has been in love with Tobias May since their very first sandbox kiss. The problem is, he’s in love with her older sister, Merrilee. And Merri is already dating one of his best friends. Rory is learning all about pining as her class reads The Great Gatsby, a book she doesn’t find “great” at all. Also not great—her GPA, something she needs to fix, quickly, if she’d like to apply for the chance to spend a week studying art with her hero in New York City over winter break. But when Ms. Gregoire assigns her to read Little Women for extra credit, Rory discovers more than she expected—both about herself and Toby. Maybe she wasn’t in love with the boy next door. . . but the boy next story. 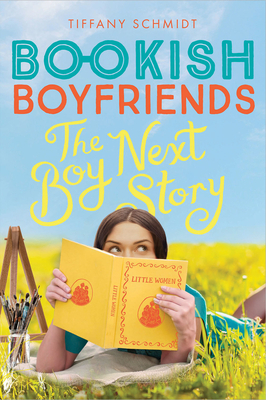 Love is complicated, and it’s all about to get even trickier for Rory at Reginald R. Hero Prep . . . where with the help of one quirky English teacher, students’ fantasies come true, often with surprising consequences. "This light rom-com holds heartbreak, surprises, and significant Campbell family dynamics that will hit home with many teens." "The Campbell girls' (mis)adventures at Hero High pick up without missing a beat in this follow-up to Bookish Boyfriends (2018) . . . Rory's story will ring a chord with die-hard romantics."